On All Saint’s Day, November 1st, Pope Julius celebrated Mass in the Sistine Chapel for the first time in four years. Those in attendance were dumbfounded by the magnificent frescoes telling nine stories from the book of Genesis. The most memorable of these is a painting called “The Creation of Adam,” where God and Adam are stretching their arms toward each other, index fingers extended. All present must have had incredible self-control to pay attention to the Mass considering the dazzling masterpiece above their heads, and the graceful statues perched on or draped over the incomparable architectural details surrounding them. The artist responsible for this stunning achievement, Michelangelo Buonarroti, grew up in Florence, Italy, which was a hot spot of the early Renaissance movement. Displaying uncommon talent by age 13, Lorenzo de’ Medici, the ruler of Florence and renowned patron of the arts, became his sponsor. After creating the sculptural masterpieces the “Pieta” (1498) and “David” (1504), he was called to Rome to work his magic on the ceiling of the Sistine Chapel. Michelangelo labored on the ceiling of the Sistine Chapel from May 1508 to October 1512, lying flat on his back cramped in a small space between the scaffold and the ceiling. The physical strain took its toll on him, and arguing constantly with Pope Julius didn’t make his working conditions any more enjoyable. Bottom line was Julius wanted the job done fast, and Michelangelo wanted the job done right. The story has come down through the ages that, aside from allowing assistants to grind his colors, the ceiling of the Sistine Chapel was completed solely by the great master. In reality, he had help from several artists he knew well from Florence, including his childhood friend Francesco Granacci, and others he had trained with. 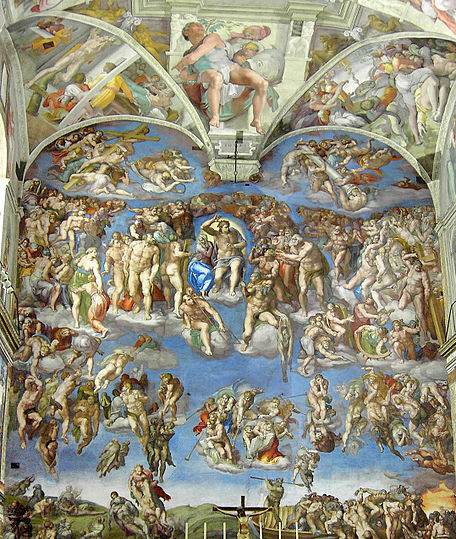 Twenty years later, Pope Paul III called upon Michelangelo and his talents again to paint another Fresco behind the Sistine Chapel’s altar. This massive painting, entitled “The Last Judgment,” is another masterpiece he’s left for humanity to enjoy through the ages. Michelangelo continued to create, draw, sculpt and paint right up until his death in 1564. I have rarely left comments criticizing the cases of improper grammar and misspelling that can be found at TIFO (in abundance), because there are so many “whiners” that lack the maturity to accept corrections. In the sentences quoted from the above article, however, there are three “whoppers” that cannot be ignored. @J.F. Gecik: It’s a “don’t have the money” attitude. Highly researched articles are insanely expensive due to the extreme time they take to produce. We offer them for free. The authors on this site do go over their works several times before submission. But as you no doubt are well aware, nobody is very good at catching typos and the like in their own works, even professional proofreaders in my experience, though they are at least better than most. I then read through the articles several times, at first lightly looking at grammar, typos, general readability, and flow, but also trying to get a general sense of the piece and the information it contains. Then I re-research the topic myself, keeping in mind what I just read to try to find factual errors and correct them where necessary. After a few cycles of that, I do one final read-through looking at grammar, typos and the like more in depth, and also trying to make sure the piece makes sense from a final content standpoint. We’ve at this point become temporary experts on the topic at hand. So it’s important at this stage to try to read it from the perspective of someone who knows nothing about the topic to make sure one isn’t making references that are confusing or leaving some key piece of information out. On the grammar side, I assure you, after years of publishing online, there is nary a facet of grammar I’m not well aware of thanks to the legions of Grammar Nazis the world over. Or as I like to say, Grammar Nazi’s. 🙂 So I do catch a lot of the mistakes. But, again, as you no doubt are aware, the more you read something, the harder it is to spot such things, and the longer the work, the more likely these mistakes are going to occasionally slip through. The latter point is why first editions of any book always, without exception, contain numerous grammatical errors and typos, no matter how many professional proofreaders the publisher threw at it. In the end, we care far more about accuracy of facts than catching all typos or grammatical errors. In a perfect world, we could afford to do both and after I was done with the fact-checking stage, I’d send the article over to a fresh set of eyes, and someone whose job was solely to focus all their brain power on looking at grammar and catching typos. And if people want to throw money at us for that purpose, we’re more than willing. 🙂 But for right now, if we turn up the grammar/typo focus light bulb, that would mean turning down the fact-checking light bulb. An awkwardly worded sentence or apostrophe where no apostrophe has any business being is preferable for a site like ours to an incorrect fact. Neither are avoidable all the time, but we really put our money in the latter to be as accurate as humanly possible. If this site was in a different genre, that might not be the case. But we make our living off our reputation for being correct.